Note: this is the longer version of an article first published at The Conservative Woman on 2nd October 2017. For the parents of any young adult raised in a household even moderately inclined towards social conservatism, EU-withdrawal, a smaller state, lower taxes and free-market economics, this is an increasingly pertinent, even worrying, question. Because, as Laura pointed out, after three years at an educational establishment which institutionally not merely disagrees with your views, but positively hates them and thinks they (and consequently you) are evil, your children will more than likely emerge from it thoroughly marinaded in left-wing thinking (and hating you in their turn). The young’s voting patterns in recent election results certainly seem to bear this out. 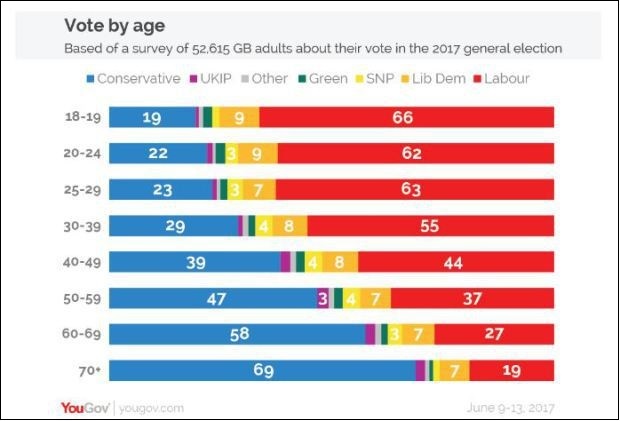 The YouGov analysis of voting by age group in the 2017 General Election shows that, in all three age-groups spanning the ages from 18 to 29, the Labour vote was over 60%. Higher Education and Academe as a bastion of left-wing indoctrination is an impression that’s widely held. But to what extent is it true? Fortunately, we have some empirical data from within the last two years. The chart below shows the results of a poll taken shortly before the 2015 General Election, asking for the voting intentions of UK University academics. The responses leave little room for doubt. In no discipline did the intention to vote Labour drop below 40%, while you have to go as low as 20% in every academic discipline before encountering a voting intention other than Labour or Green. Overall, the academics’ voting intention went 83% to the four main parties of the Left (Labour, LibDems, SNP and Green), while in the General Election proper, their vote share was only 47%. In other words, university-tenured academics inclined towards parties of the Left at a frequency nearly double that of the electorate as a whole. A similar poll of UK academics’ voting intentions was conducted in the run-up to the 2016 EU Referendum, by The Times Higher Education Supplement. Here, the results were even starker. 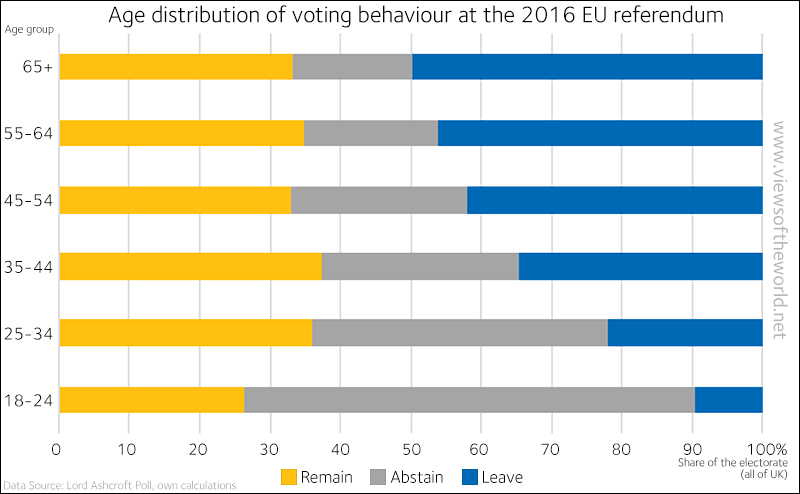 In no discipline was the intention to vote Remain below 80%, while in only one discipline, Engineering and Technology, did the intention to vote Leave break through the 15% threshold. As everyone now knows, the result was 52%-48% for Leave. Once again the academics leaned Remain-wards at a rate more than 1½ times that of the voting population. So, on the face of it at least, the perception of the University experience as being an academic indoctrination process in Europhilia and Leftism has some evidential support. If you have the impression that your child has emerged from University brainwashed into an ardently-Europhile Leftist who hates you and everything you stand for, you’re probably right. But what seems explored much more rarely is: why this should be so? Why should the supposedly academic and intellectual elite overwhelmingly incline towards leftist and statist parties and policies that concentrate decision-making power in bureaucracy rather than democracy, and reject those which favour liberal-individualism and free-market competition? And do so, moreover, at a incidence nearly double that found in the adult population as a whole? Well, the first thing to remember is that this phenomenon isn’t new. Hayek analysed and excoriated it decades ago in his “The Intellectuals and Socialism”, famously referring to “the professional second-hand dealers in ideas”. Politically, the Academic and Intellectual Elite has an aversion to capitalism and free-market competition because, being a system based on voluntary exchange reflecting consumer preferences, it doesn’t confer on them either the superior societal status or the monetary rewards to which they consider themselves entitled because of their (assumed) far superior intellect. This is especially marked when they compare themselves with people successful in what, to them, is the rather grubby business of designing, producing and marketing products that people will voluntarily part with their hard-earned, post-tax cash to own. Think, for example, how much more popular in the public mind James Dyson is than A C Grayling. The old disdain for “trade” has crossed over from the Aristocratic Landed Elite to the Intellectual Academic Elite. Consequently, the academics and intellectuals incline, politically, away from free-markets democracy towards the more collectivist politics of markets-averse, leftist-statist bureaucracy. Not only does it value them more than competitive free-market capitalism does: but it can also use the coercive power of the State, manifested via the taxation system, to enforce on wider society at least a financial recognition of their assumed superior intellect and desired superior status. This also explains their near-homogeneous support for remaining in the European Union. Yes, academics and intellectuals do favour the EU as an additional source of funding. But because the EU is an essentially socialistic, authoritarian, top-down bureaucracy, they also view it as a means to impose on the UK the kind of Leftist policies which they themselves are attracted to, and without the necessity and inconvenience of obtaining popular democratic consent. Remember, as we saw in the aftermath of the EU Referendum, their opinion of the demos borders on contempt. This leads to the next question. For how long do the academics’ and intellectuals’ pro-Left, pro-EU biases continue to influence their recipients’ voting behaviours after inculcation? Conventional psephology held that most had grown out of their youthful flirtation with socialism by about 30, by which time advancing careers, along with marriage, family and mortgage responsibilities, had altered their perspective. Indeed, as late as April this year, a YouGov poll suggested that the Left-Right crossover point comes roughly at age 34. However, the results of the 2017 General Election have forced a re-evaluation of that hypothesis. It seems that the Labour/Left voting tendency now persists for at least a decade beyond that. As the Ipsos MORI chart below shows, the phenomenon now extends well into the 40s, and that it’s only after 45 that a Conservative-leaning tendency starts to prevail. 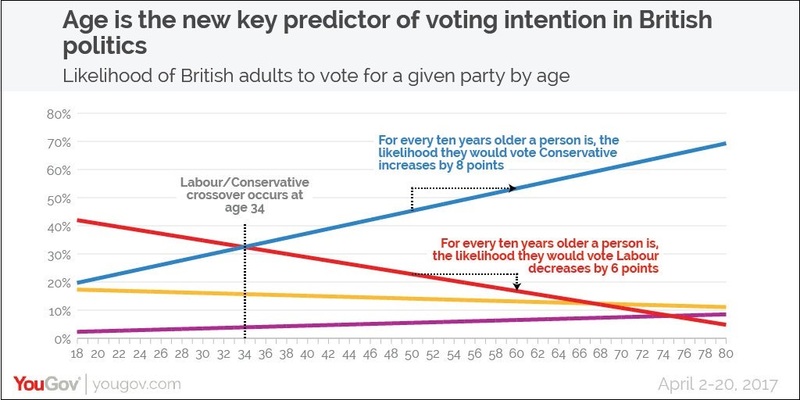 This seems to bear out what Iain Martin has recently written on “the widespread assumption among those aged below 45 that Tories or pro-market people are an inherently bad bunch with motives that are inherently evil”. Perhaps, though, it could have been better predicted. Because the age distribution of voting patterns in the 2016 EU Referendum shows a similar pattern. Once again, it’s only at the 45-54 age group does Leave start to prevail over Remain. Neither does this look to be a temporary aberration, attributable to the more fractious political atmosphere before, during and since the EU Referendum. The pattern seems to be persisting, and hardening. 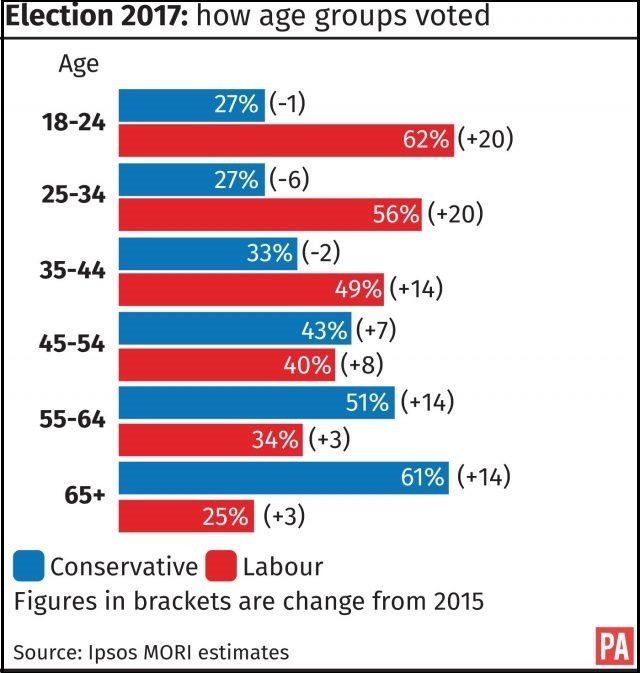 The Remain=Labour and Leave=Conservative assumptions are by definition somewhat crude proxies, but it does appear that an overall shift in age-related voting patterns may be taking root for the short-to-medium term at least. As far as countering it is concerned, the first thing to remember is that this may not, after all, be so historically unprecedented, and so in the end be so permanent, as excitable media comment suggests. Albeit not of the same magnitude, there have been similar trends observed before, as the chart below of under-30s percentage voting patterns in General Elections since 1964 shows. The under-30s Labour vote almost halved between 1964 and 1983, and again between 1997 and 2010. However, that might be where the optimism ends, at least for the time being. In 1983, the Conservative Party, though faced with a Labour opposition similar to Corbyn’s in its socialist programme, was itself ideologically committed to a smaller state, free markets and capitalism, and unafraid to take on its opponents publicly in the battle of ideas. In 2010, it benefited from a widespread disillusionment with the dysfunctional Brown government after 13 years of increasingly tawdry New Labour. Today’s circumstances, however, are nowhere near so propitious. First, no-one under 50 has much, if any, memory of what life in Britain was like under the last real even semi-socialist government: and given the prevalence of left-wing attitudes in higher education, they may well not have been taught an accurate history of it. To under 50s who lean Left-wards, therefore, Corbynism, however flawed, can seem fresh and exciting. Far worse, though, is that, as has been so starkly shown this past week, the Conservative Party is mired in intellectual atrophy, apparently completely incapable of unashamedly making the case against state-socialism and for a lower-taxed, less-regulated and more entrepreneurial economy, capitalism and free markets. So ideologically-sapped, and so devoid of confidence, does it appear, that it is reduced to offering, almost apologetically, diluted versions of previous flagship Labour policies. Unless the Conservative Party is jolted from its torpor by the prospect of impending ejection from office and replacement by the most disastrously socialist government since the Labour Party’s formation, then the left-wing ideological indoctrination of the young via higher education – and Laura was surely right in her original 22nd August article to suggest that one of Blair’s motives in greatly expanding university access was to expose more to it – will yield results, with dire consequences, not least for those welcoming it.